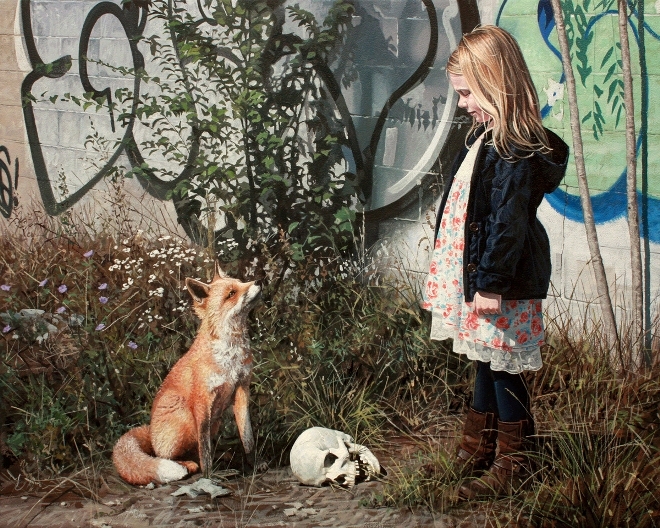 Kevin Peterson creates art that reminds the viewer of fairytales they heard growing up. In his art we always meet children and various animals. However, his paintings show the real side of the world, portrays various problems and makes the viewer question his actions. Kevin Peterson was born in 1979 in Nevada. After graduating high school he studied art and psychology in Austin College in Sherman, however, after getting his degree in 2001, he did not work in the field of art, he spent 3 years as a probation officer. During this time, Kevin had a lot of difficulties with drugs and alcohol, which eventually led him to an arrest and the loss of his job. While being treated from drug/alcohol addiction, Kevin rediscovered his passion for art. Kevin turned his life around in 2005. He quit alcohol and drugs and pursued his career as an artist and has been sober ever since. In Kevin Peterson’s art there is clear sights of loneliness, weirdness and a sense of survival. Artists has said that he often paints destroyed cities, which convey loneliness, hope and sorrow. However, even though there are many themes of sadness and thinking in his work, he tries to show it all in an optimistic way. In his art there are many warm, bright colors. According to the artist, his work is about the varied journeys that we take through life. It is all about growing up and living in a broken world full of pain, trauma and loneliness. It takes a lot of courage and strength to survive and thrive. He has said that his work deals with isolation and longing teamed with optimistic hope. It also questions the forces that instruments our behavior. 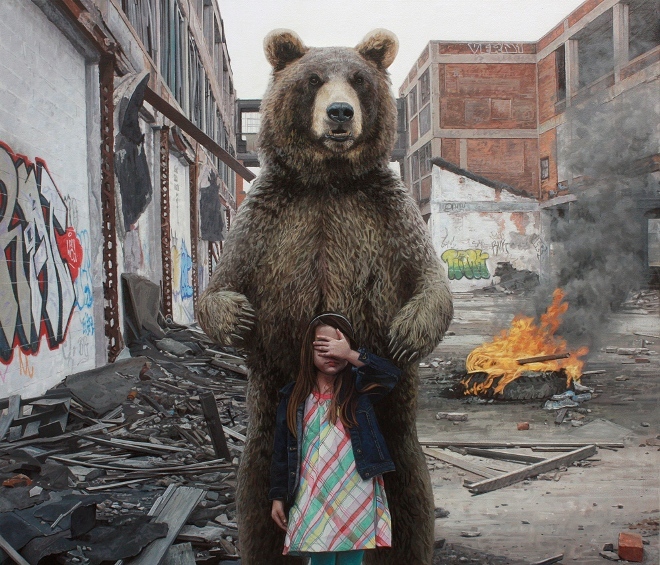 Kevin Peterson paints detailed work of young children and animals surrounded by dystopian urban environments. 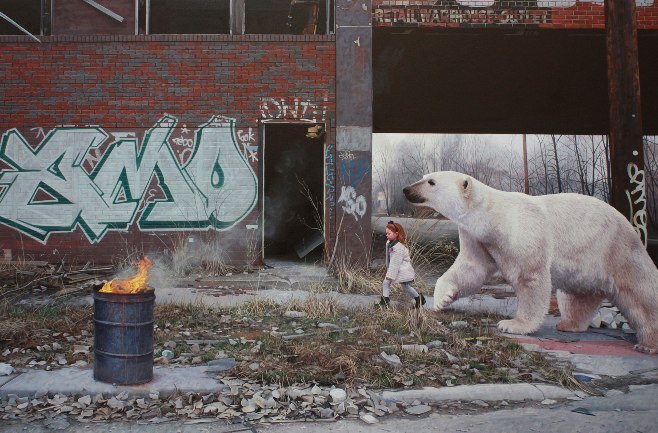 Children standing alone, accompanied only by wild beers, lions and raccoons in an abandoned and destroyed city. 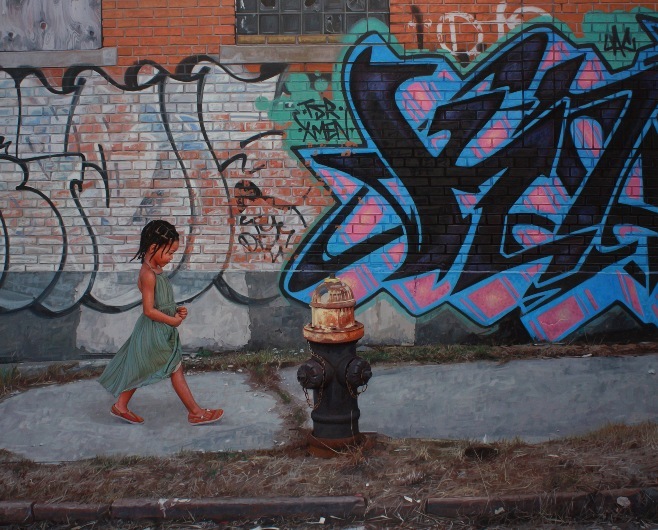 Kevin Peterson’s earlier work showed children walking, exploring, but his more recent work shows young subjects paused, standing and not moving. Moreover, in his latest work there is a lot more background, there is a much wider view of the scene and that gives more story to the painting. 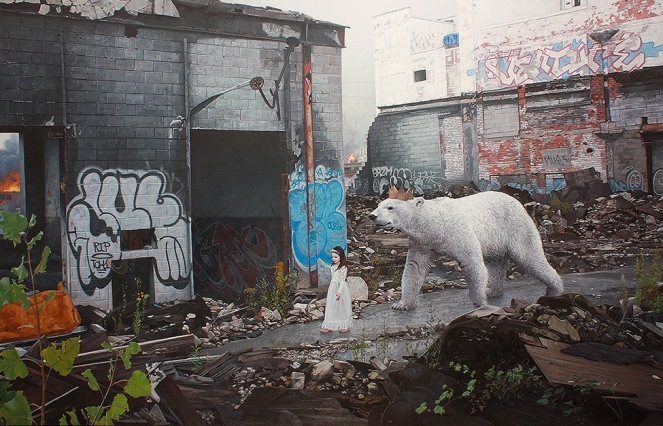 Kevin tries to show the contrast: the innocence of a child against destroyed environment. He puts a young child in a place where you would not see a young person alone. It is kind of a metaphor of growing up. Another aspect in his art is time – the way we change and the way our surroundings change. I his work there are a lot of signs of street art. 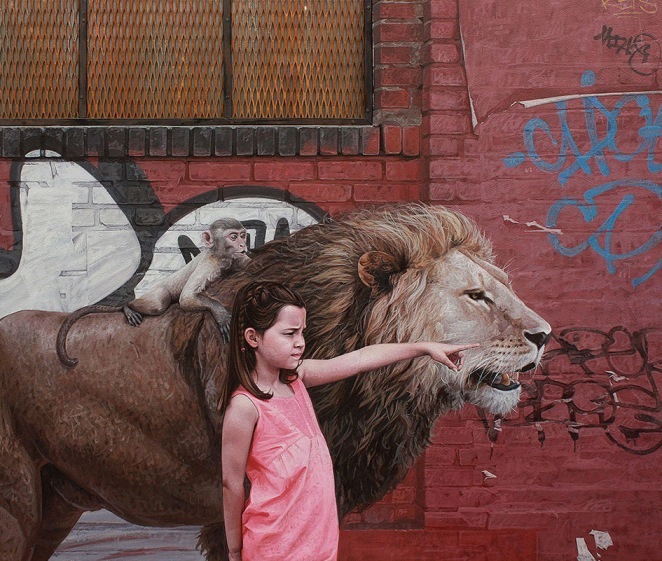 Surprisingly, Kevin Peterson has had a brief career doing the street art. That is how all the street details look so real in his work. However, he quit doing street art after some law issues, furthermore, he and his wife had a baby, so it was time to become more of a grown up. 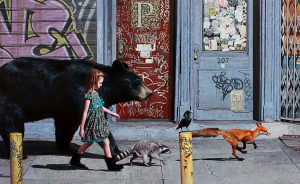 Kevin Peterson starts his art process by having a sketch of a painting on Photoshop. He has a lot of pictures of urban settings, he pairs them with a photo of a model and lays out the composition. After that, he adds some animals he thinks would suit the piece of art. Of course, when he is painting, he changes some of the details, decides what is needed and what is not necessary. Artist lives in Houston, Texas and is represented by “Thinkspace gallery”. He also shares his work on Instagram.